One of the great things about running DA is that it gives me an excuse to buy fancy camera equipment and play with it. The latest subject I’m infatuated with is stars. No, I haven’t joined the paparazzi. 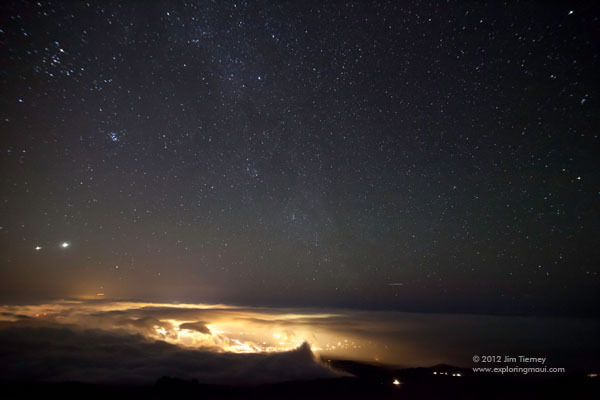 I’m talking about the stars you can see when you’re 10,000 feet up on a rock in the middle of the Pacific ( the Haleakala volcano in Maui). Photography is absolutely amazing. It really forces you to be present in the place you’re at and the moment you’re there. I was hanging around E3 on Tuesday, indulging my gamer geek side (games are a sister industry to the film industry so I get in on an industry pass, but I have no real legit business reason to go. It’s just fun.). One of the things I’ve noticed about games is that the ‘look’ is still very much the same as it ever was. Yes, the polygon counts are higher and everything is in HD, but the look is the same. No depth of field and harsh lighting (usually either on or off). I was looking at a couple up and coming games and they just reminded me of Half-Life and every other game I’ve played. They look better, but they don’t look like film. This is interesting, because films are starting to look like games and I don’t think it’s a good direction. I want games to start looking like films, not the other way around. Where is this ‘Game Look’ for films coming from? I think it starts with 3D. 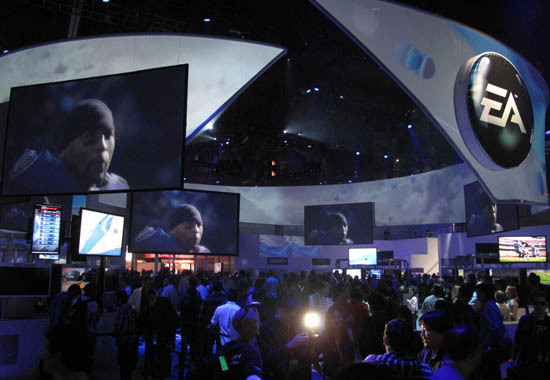 One of the smaller booths (You should’ve seen the xbox, ps3, wii booths) at E3 this year. Did you see the before and after shots that Britney Spears released? Can’t say I’m a huge fan and I would never have imagined I’d be mentioning her in the Digital Anarchy blog, but, yet, I just did. She released retouched AND unretouched photos of herself, and put them out there for comparison. The article breaks down the shots and what was changed. While I think it was a very worthwhile thing for her to do, I really wish she’d given a more intelligent quote and actually address the issue instead of saying ‘it was fun being shot in front of a wall of cotton candy’. sigh. Click here for the article. It reminds me of the Dove ad that takes a model from walking into the studio, through the shoot, through photoshop, and out on a billboard. Amazing commercial bringing attention to the same issues. This might seem like an odd conversation for a company that makes software to do retouching, like Beauty Box, to be promoting.